Looking to convert your blow thru carbureted turbo engine to EFI? Look no further than the Holley Sniper EFI 1250 HP Super Sniper fuel injection systems. These systems feature 8, 100LB/HR Fuel Injectors capable of supporting up to 1250 HP on forced induction or dry nitrous applications. Did we mention the Super Sniper also has full nitrous control built-in? That's right, no need for a separate nitrous controller! Every Super Sniper EFI system also comes with a USB to CAN tuning cable, as well as free downloadable Sniper EFI Software to give you unlimited control of your engine. Eight 100 Lb/Hr Injectors (Forced Induction). The 800 CFM Main Body will support 700 Horsepower Naturally Aspirated. Compatible with Draw thru or blow thru forced induction applications. Built-in Single stage progressive nitrous control. Integrated ignition timing control for precise timing curves. Only 4 Wiring Connections Required! (Battery +, Battery-, Switched Ignition & RPM). Internal fuel pressure regulator eliminates the hassle of plumbing an external fuel pressure regulator (Preset to 58.5 PSI) for N/A or Nitrous applications. Self-tuning ECU means you don't have to be a computer/tuning wiz to have EFI! High-Resolution Full Color Touchscreen for initial Setup, Tuning, and Gauge Displays. Simple Calibration Wizard (Answer a few questions about your engine, and it creates the base map, then starts tuning on its own!) - NO laptop required! The included Genuine Bosch LSU 4.9 Wideband Oxygen Sensor provides real-time Fuel Map Learn! OEM Style TPS/IAC and fuel pressure regulator, for years of dependable service. Included clamp-on oxygen sensor kit ensures a leak-free oxygen sensor installation, with Stainless Steel T-Bolt clamps and a Stainless Steel (Weldable) oxygen sensor flange. 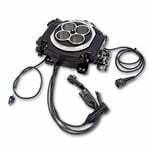 Throttle body mounted ECU – no extra boxes to mount. USB to CAN Communication cable included for easy laptop tuning of advanced controls. Dual Pattern bolt on carburetor replacement, designed to fit 4150 Flange & Spread Bore manifolds - (Spread Bore Sealing Plate Part #9006 recommended). Compatible with Holley EFI analog gauges and electronic dashes. Injector Size (lbs/hr): 100 lbs./hr.